“In December 1776, a small boat delivered an old man to France.” So begins a dazzling narrative account of Benjamin Franklin’s French mission, the most exacting—and momentous—eight years of his life. When Franklin embarked, the colonies were without money, munitions, gunpowder, or common cause; like all adolescents, they were to discover that there was a difference between declaring independence and achieving it. To close that gap Franklin was dispatched to Paris, amid great secrecy, across a winter sea thick with enemy cruisers. He was 70 years old, without any diplomatic training, and possessed of the most rudimentary French. He was also among the most famous men in the world. Franklin well understood that he was off on the greatest gamble of his career. But despite minimal direction from Congress he was soon outwitting the British secret service and stirring passion for a republic in an absolute monarchy. 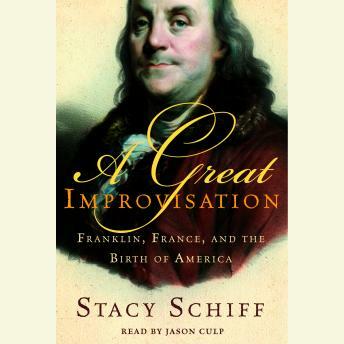 In A Great Improvisation Pulitzer Prize winner Stacy Schiff offers an utterly fresh and thrilling account of Franklin’s Parisian adventure and of America’s debut on the world stage. Schiff weaves her tale of international intrigue from new and little-known primary sources, working from a host of diplomatic archives, family papers, and intelligence reports. From her pages emerges a particularly human Founding Father, as well as a vivid sense of how fragile, improvisational, and international was our country’ s bid for independence.